Call Me Lightning, of Milwaukee, WI, play frenetic post-punk informed by the Talking Heads' quirky pop and the Jesus Lizard's rambunctious absurdum. Call Me Lightning entered Steve Albini's Electrical Audio in Chicago with engineer Greg Norman in Summer of '06 to begin recording the follow-up to their 2004 debut, THE TROUBLE WE'RE IN. 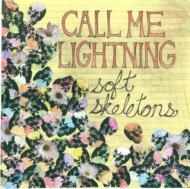 The result is SOFT SKELETONS an eleven song blast of youthful energy, wicked riffery and unapologetic fun.